Decaf can taste like real coffee? Yes! The key to a great, you-don’t-even-know-its-decaf is using a natural, non-toxic decaffeination process and great green beans. Every green coffee bean contains approximately 1,000 naturally occurring chemicals that create what we identify as texture, taste, aroma, and vibrancy. During the decaffeination process, the caffeine chemical is extracted from the bean using either chemicals or water and / or pressure. The challenge in decaffeination is removing the caffeine chemical without diminishing, altering, or removing other naturally occurring chemicals that create ‘coffee’. While there are four primary methods of decaffeination, we are focusing only on the two non-solvent, natural decaffeination processes used by Queen Bean Coffee Company and Mills Coffee: Swiss Water Process (SWP) and Carbon Dioxide (CO2) Processes — the latter being the process used on of 95%+ of our decaf offerings. The SWP method was introduced in the 1980s and relies on Green Coffee Extract (GCE). GCE is created by soaking a small batch of green coffee beans in very hot water. The water lures the caffeine from the bean and into the water. The caffeinated water is then drained through a porous filter that captures only the caffeine molecules, effectively creating one container of tasteless beans and one container of molecule rich water. The tasteless beans are discarded. The non-caffeinated, molecule rich water (which has all the chemicals needed to create what we think of as coffee) is kept and renamed GCE or Green Coffee Extract. With GCE in hand, the decaffeination of green beans that will go to roast can begin! First, a fresh batch of green beans is immersed in a tank full of GCE. The molecule rich GCE and green beans reach chemical equilibrium by rebalancing the caffeine content. As with the creation of GCE, the caffeine migrates from the green beans to the GCE water so that the beans and water are equally caffeinated. The GCE water is then passed through a caffeine-capturing filter and the process is repeated until the beans are 99.9% caffeine-free. This process takes between 8-10 hours and leaves us with flavorful, decaffeinated beans thanks to the molecule concentrated GCE. 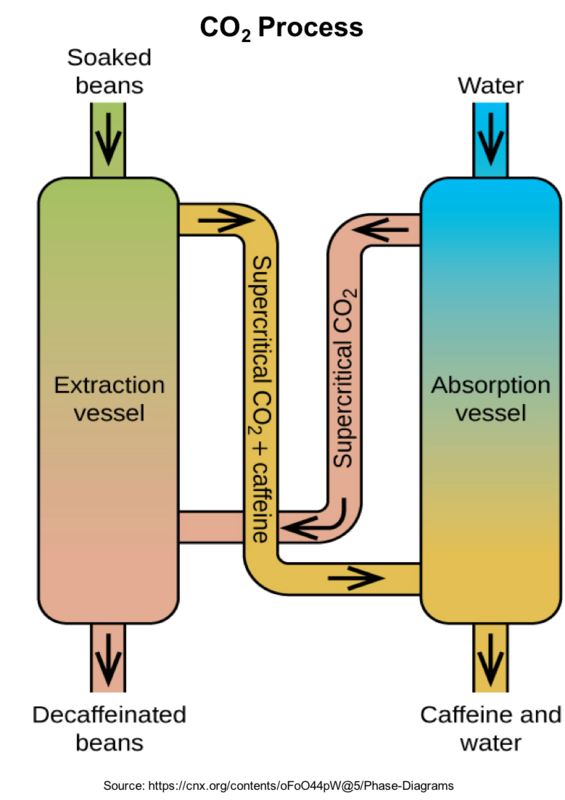 The CO2Process, developed by Kurt Zosel, similarly extracts just the caffeine chemical but does so with liquid CO2 rather than GCE. 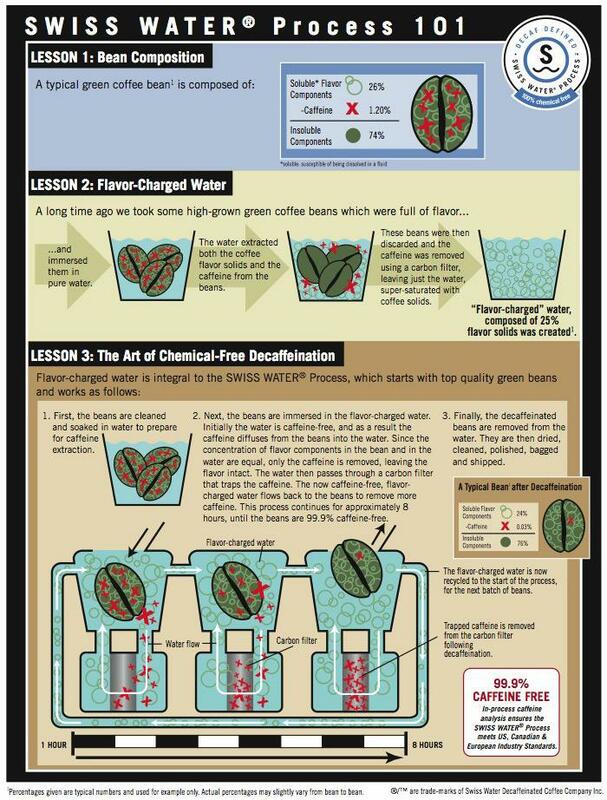 In CO2 decaffeination, green beans are immersed in a sealed water container known as an extraction chamber. Liquid CO2 is then forced at a pressure of 1,000 pounds per square inch into the extraction chamber, drawing the caffeine out of the green beans and dissolving it. Once the caffeine is successfully extracted, the caffeine-rich CO2 is transferred from the extraction chamber to a low pressure absorption chamber that allows the CO2 to return to a gaseous, caffeine-free state. The CO2 process is a natural, safe process that preserves the beans’ innate chemical makeup. The result is wonderfully, rich, flavorful coffee. We at QueenBean Coffee Company ran a few taste tests with our regular French Roast and French Roast decaf (CO2 processed) coffees. Even among regular French Roast drinkers, very few could identify which was decaf… of those who did, we aren’t sure who could really tell and who had a lucky guess! If you are ready to get some decaf, click here!